Welcome to the Wednesday card sketch challenge with the Paper Craft Crew. Here is this week's sketch. I've used cardstock of Soft Sky, Crumb Cake and Real Red with patterned paper from the Home for Christmas designer paper pack. The Crumb Cake background has been embossed with the Brick Wall embossing folder and the Soft Sky panel with the Decorative dots embossing folder. The "Jolly" comes from the Christmas Greetings thinlits dies. I've also added a Silver foil doily to my card and an Expressions Snowflake. This is another card with absolutely no stamping, however I did sponge some ink over the Brick wall background. Thanks so much for stopping by today to see the Paper Craft Crew challenge. Please pop on over to the site for further inspiration from our Design Team. We look forward to you joining us and can't wait to see what you make. 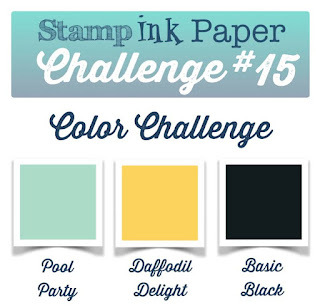 Welcome to another challenge at Stamp Ink Paper. This week we have a challenge to suit you. Yes, its your choice to use your favourite products for your card. Here are the details. Today I've decided to make another Christmas card and I'm featuring the Home for Christmas designer papers and the Christmas Greeting thinlit dies. This is a non stamped card. I decided to make my little Santa cut out with the Circle framelits look like a Christmas bauble by adding ribbon to the top. The cardstock used is Crumb Cake, Real Red and Whisper White. While I can't lay claim to any favourite stamps on this card, this is certainly my favourite Christmas dsp from the Holiday catalogue. 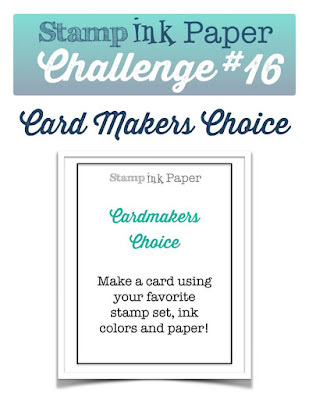 We can't wait to see what you make this week for the Stamp Ink Paper challenge. Please come and visit our site for more inspiration from our talented design team and have a great day. The Christmas card I want to share with you today was made at my Christmas Card class on Friday and was inspired by the sample on page 12 of our Christmas catalogue which combined the Music Designer paper from the Home for Christmas paper pack with the Snowflake elements and Jingle all the way stamp set. I've also incorporated the Sleigh ride edgelits and the background stamp from the set You've got this and a small bit of red dsp from the Christmas paper pack in the main catalogue. The cardstock used is Basic Black, Pool Party and Very Vanilla and the inks are Pool Party, Pear Pizzazz and Memento Black ink. I've also lightly inked the edges of the edgelits die cut to give it some definition and raised that panel on dimentionals over the card. Thanks so much for stopping by today. I hope you're having an enjoyable weekend. I am really loving the simplicity of today's Christmas card. Its just a base of Basic Black Cardstock with a Whisper White die cut panel cut using the Sleigh Ride Edgelits. Come and have a look. These are Edgelits and stamp set Jingle all the Way are among my favourite of the new products in our Holiday catalogue. I've also used one of the new Winter Wonderland embellishments on this card along with a few sequins. Thanks so much for stopping by today. I hope you have a great weekend. I'm back with another Christmas card today, as I've been on these all week with my class that was held here this morning. This is a vertical version of a similar card I made using the Hardwood background stamp combined with the Home for Christmas designer paper and the Hearth and Home framelits. This one was actually part of this morning's class. The cardstock used is Mossy Meadow, Crumb Cake and Whisper White. The Hardwood was stamped with Crumb Cake ink and the edges sponged with Soft Suede ink. The window frame and window sill here have been raised up on dimentionals and I've added a greeting from the Tiny tiny sentiments set punched out with the Word Window punch and adhered to the sill. I think this is a great use of the designer paper Home for Christmas. You can get lots of trees from this sheet to make lots of cards if used this way. Its quite economical. Here's another simple Christmas card today using some of last years Specialty Christmas foiled paper up from the pack All is Calm. The cardstock is Pool Party and Basic Black and yes its simple, but I love how this card turned out. Thanks so much for stopping by to see today's card. Have a great day. Its another Wednesday and that means is a new Paper Craft Crew challenge this week. Here is this week's challenge. This one opens up so many possibilities. We can't wait to see what you create. You may choose to follow any line, so long as you do three in a row. Here's what I chose to do using the top row across "Any purple, Happy Birthday, Butterfly". I made this easel card using Blackberry Bliss, Perfect Plum and Whisper White. The base of my card starts as a square and is 14 x 14 cm when folded. The front is folded in half again, and the bottom pic will give you a better idea of how it sits when propped up agains the Happy Birthday greeting from the Butterfly basics stamp set. That becomes the anchor of the easel, as it has been mat with Blackberry Bliss card and placed on dimentionals. Happy Tuesday to you all. It has been a pretty fantastic Tuesday for me because we went Whale Watching as a family with Whale One from Mooloolaba today. It was actually a birthday present, and something thats been on my wishlist for a while. Today I have the Stamp Ink Paper challenge this week and its a colour challenge using these colours below. As I have been playing with my Christmas products I wanted to use them in this challenge regardless of the fact that these colours do not speak Christmas in the traditional sense at all. Here's my card using the Sleigh Ride Edgelits and stamp sets Jingle all the Way and Cozy Christmas. The bottom edge layer has been raised on dimentionals and the Daffodil Delight colour is only incorporated as ink for the Moon, stars and greeting. We are looking forward to what you will create with these colours this week and hope you will join us at Stamp Ink Paper. I've made another card similar to the Christmas wishes one a few days ago with the Poinsettia background paper. This time I'm using up some retired paper stock called Candlelight Christmas which was a specialty pack from a couple of years back. Come and have a look. The cardstock is Early Espresso and Very Vanilla and the ink is also Early Espresso used with the stamp set Cozy Christmas for this greeting. There's a little bit of Melon Mambo trim used here along with a Silver foil doily, Oval collection framelits and Banner punch. Welcome to my blog and today's post for all my new followers. I am actually on a roll this weekend making Christmas cards. I have upcoming classes to prepare for and some orders to fill. I also supply a local gift shop with cards, so I generally make many more cards than I will ever use myself and if I have spares I like to support our Aussie troops and send cards to a lady who organises Christmas cards for Aussie troops, sending them overseas, so they can write home to their families. I love a weekend where I can actually be productive and this one has been thus far. Come and have a look at today's card. Its a combination of the Home for Christmas designer paper which I've combined with the Hearth and Home framelit, the Wood panel background stamp and a greeting from the stamp set Cozy Christmas. I'm back to making Christmas Cards today. This one combines the Home for Christmas designer paper combined with the Cozy Christmas stamp set and was inspired by the stamped pointsettia card on P31 of the holiday catalogue. I've used a base of Early Espresso cardstock. Please come and have a look. I've stamped the greeting onto Very Vanilla cardstock, cut with the Oval collection framelits and used the banner punch on some Real Red card to place under, all on a Gold foil doily. Its a reasonably quick card using the patterned paper for the background rather than creating my own by stamping, and I'm pleased with how it turned out. Thanks for stopping by today. Have a great weekend. This card is for my daughter's friend Renae who's having a party tomorrow. It's a purple themed party for a girl that really loves black, so I've combined the two colours. Come and have a look at this card. I've used Watercolor Wings stamp for the top of my layered butterfly here combined with Butterfly Thinlit dies. The cardstock for this card is Basic Black, Wisper White and Perfect Plum. I've also combined some Wisteria Wonder in the form of ribbon and inks. The Whisper White panel on the card front has been embossed with the Fluttering Embossing folder and I've cut the panel where the butterfly sits with the Deco Label framelits. Come and see the rest of the card. Here is a side view so you can see how the easel sits. The greeting used is from the Butterfly Basics stamp set and the 16 is stamped with the Memorable Moments stamp set and punched out with the Hexagon punch. Here is a closeup. Today's card features another one of those Watercolor wings butterflies stamped with the Photopolymer set of the same name and die cut with the Bold Butterfly framelit. This time I've placed it on a background created with the Striped Scallop framelit. Come and have a look. The cardstock I've used for my card is Rich Razzleberry, Whisper White and Early Espresso. Inks are Rich Razzleberry, Daffodil Delight and Perfect Plum. I've used my Razzleberry Blendabilities pens (darkest colour) to colour the Basic Rhinestones I've used for my card. The Happy Birthday greeting comes from the Basic Butterflies stamp set. I'm really happy with how the butterfly pops on this background. What do you think of it? I would love to have some feedback and I want to thank you so much for stopping by. Have a great day. 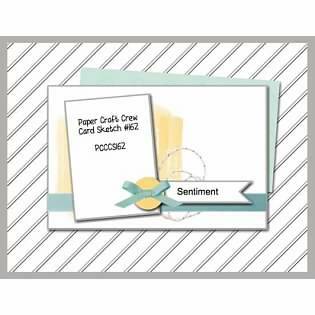 Welcome to the Wednesday Card sketch challenge this week at the Paper Craft Crew. Below is our sketch for this week. We hope you will join us. Today I've decided to use patterned paper from the designer pack English Garden on my card combined with Butterfly Basics and Watercolor Wings stamps and Lots of Tags & Butterfly Thinlits dies. The cardstock is Crumb Cake, Island Indigo, Whisper White and Delightful Dijon. I did change things up ever so slightly from the sketch this week and made my card with a square base. The inks used were Island Indigo, Crumb Cake and Smoky Slate. Thanks so much for stopping by this week to view my card. 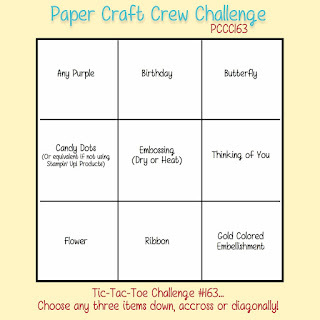 We hope you will join us at the Paper Craft Crew with an entry of your own this week. We can't wait to see your creation.